December 1980 somberly arrived in a gray cloud of disappointment as I became the involuntary star in my own soap opera, a hapless heroine who faced the camera at the end of each day and asked, “Why?” as the scene faded to black. Short of being tied to a railroad track within the sound of an oncoming train, I found myself in a dire situation, wondering how my life turned into such a calamity of sorry events. I was unemployed and had a two-year-old daughter, a six-week-old son, an unemployed husband who left the state looking for work, and a broken furnace with no money to fix it. To compound the issues, I lived in the same small Idaho town as my wealthy parents, and they refused to help. This scenario was more like The Grapes of Wrath than The Sound of Music. After getting the children to bed, I would sit alone in my rocking chair and wonder what went wrong. I thought I had followed the correct path by having a college degree before marriage and then working four years before having children. My plan was to stay home with two children for five years and then return to a satisfying, lucrative career. But no, suddenly I was poor and didn’t have money to feed the kids or buy them presents. I didn’t even have enough money for a cheap bottle of wine. At least I was breast-feeding the baby, so that cut down on grocery bills. And, my daughter thought macaroni and cheese was what everyone had every night for dinner. Sometimes I would add a wiggly gelatin concoction, and she would squeal with delight. Toddlers don’t know or care if mommy earned Phi Beta Kappa scholastic honors in college. They just want to squish Jell-o through their teeth. The course of events that lead to that December unfolded like a fateful temptation. I was 26 years old in 1978 and energetically working as an assistant director for the University of Utah in Salt Lake City. My husband had a professional job in an advertising agency, and we owned a modest but new home. After our daughter was born, we decided to move to my hometown of Wendell, Idaho, population 1,200, to help my father with his businesses. He owned about 30,000 acres of land, 1,000 head of cattle, and more than 50 18-wheel diesel trucks. He had earned his vast fortune on his own, and his philosophy of life was to work hard and die, a goal he achieved at the young age of 60. In hindsight, by moving back home I probably was trying to establish the warm relationship with my father that I had always wanted. I should have known better. My father was not into relationships, and even though he was incredibly successful in business, life at home was painfully cold. His home, inspired by the designs of Frank Lloyd Wright, was his castle. The semi-circle structure was designed of rock and cement and perched on a hill overlooking rolling acres of crops. He controlled the furnishings and artwork. Just inside the front door hung a huge metal shield adorned with sharp swords. An Indian buckskin shield and arrows were on another wall. In the corner, a fierce wooden warrior held a long spear, ever ready to strike. A metal breast plate hung over the fireplace, and four wooden, naked Aborigine busts perched on the stereo cabinet. The floors were polished cement, and the bathrooms had purple toilets. I grew up thinking this décor was normal. I remember the first time I entered my friend’s home and gasped out loud at the sight of matching furniture, floral wallpaper, delicate vases full of fresh flowers, and walls plastered with family photographs, pastoral scenes, and framed Normal Rockwell prints. On the rare occasions that I was allowed to sleep over at a friend’s house, I couldn’t believe that the family woke up calmly and gathered together to have a pleasant breakfast. At my childhood home, my father would put on John Philip Sousa march records at 6:00 a.m., turn up the volume, and go up and down the hallway knocking on our bedroom doors calling, “Hustle. Hustle. Get up! Time is money!” Then my brothers and I would hurry out of bed, pull on work clothes, and get outside to do our assigned farm chores. As I moved sprinkler pipe or hoed beets or pulled weeds in the potato fields, I often reflected on my friends who were gathered at their breakfast tables, smiling over plates of pancakes and bacon. I knew at a young age that my home life was not normal. There were momentary lapses in sanity when I wondered if I should have been more like my mother. I grew up watching her dutifully scurry around as she desperately tried to serve and obey. My father demanded a hot dinner on the table every night, even though the time could vary as much as three hours. My mother would add milk to the gravy, cover the meat with tin foil (which she later washed and reused), and admonish her children to be patient. “Your father works so hard,” she would say. “We will wait for him.” I opted not to emulate most of her habits. She fit the role of her time, and I still admire her goodness. My husband worked for my father, and we lived out in the country in one of my father’s houses. One afternoon in August of 1980, they got into a verbal fight and my dad fired my husband. I was pregnant with our second child. We were instructed to move, and so we found a tiny house in town and then my husband left to look for work because jobs weren’t all that plentiful in Wendell. Our son was born in October, weighing in at a healthy 11 pounds. The next month, we scraped together enough money to buy a turkey breast for Thanksgiving. By December, our meager savings were gone, and we had no income. I was determined to celebrate Christmas. We found a scraggly tree and decorated it with handmade ornaments. My daughter and I made cookies and sang songs. I copied photographs of the kids in their pajamas and made calendars as gifts. This was before personal computers, so I drew the calendar pages, stapled them to cardboard covered with fabric, and glued red rickrack around the edges. It was all I have to give to my family and friends. Just as my personal soap opera was about to be renewed for another season, my life started to change. One afternoon, about a week before Christmas, I received a call from one of my father’s employees. He was “in the neighborhood” and heard that my furnace was broken. He fixed it for free and wished me a Merry Christmas. I handed him a calendar and he pretended to be overjoyed. The next day the mother of a childhood friend arrived at my door with two of her chickens, plucked and packaged. She said they had extras to give away. Again, I humbly handed her a calendar. More little miracles occurred. A friend brought a box of baby clothes that her boy had outgrown and teased me about my infant son wearing his sister’s hand-me-down, pink pajamas. Then another friend of my mother’s arrived with wrapped toys to put under the tree. The doorbell continued to ring, and I received casseroles, offers to babysit, more presents, and a bouquet of fresh flowers. I ran out of calendars to give in return. To this day, I weep every time I think of these simple but loving gestures. 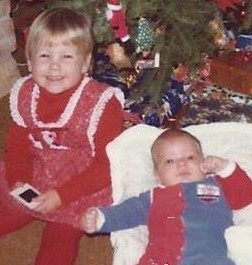 Christmas of 1980 was a pivotal time in my life, and I am grateful that I received the true gifts of the season. My precious daughter, so eager to be happy, was amazed at the wonderful sights around our tree. My infant son, a blessing of hope, smiled at me every morning and gave me the determination to switch off the melodrama in my mind. 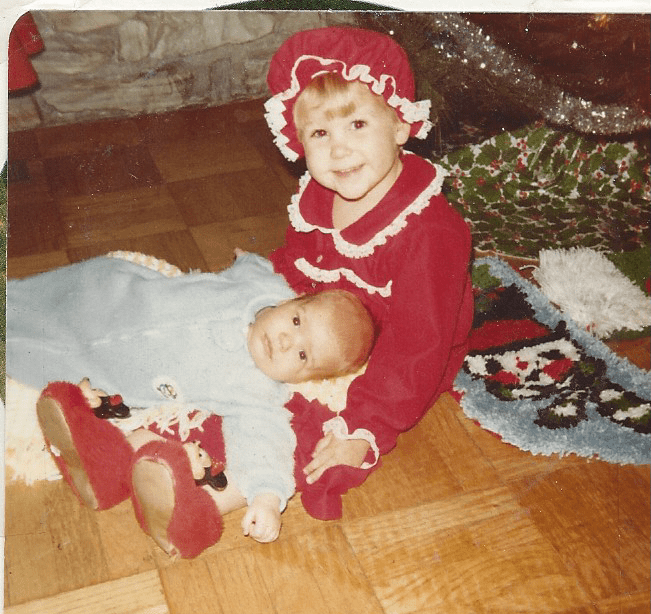 The day before Christmas my husband was offered a professional job at an advertising agency in Boise, and we leaped from despair to profound joy. On Christmas Eve, I rocked both babies in my lap and sang them to sleep in heavenly peace. They never noticed my tears falling upon their sweet cheeks. I love your story. It gives me great insight into your humor and grit. I admire you as a woman, a mother and a writer! So glad to have discovered YOU and your work. Merry Christmas. Thanks, Joan. Merry Christmas to you and yours, too! That was beautiful. I think the choice to find joy and humor in the world no matter what you have endured is a powerful one. I love how people stepped in to help you in your time of need. I remember the times others have helped me and then I love turning around and paying it forward and helping others. Blessings on your family in 2016. Yup….we had a very similar childhood. I think you’re right, Donna. Mom had something to do with it. Merry Christmas and Happy New Year!